Now without the “agreed” sign and with no published proposal for redevelopment. No specific reference (that I can find) in the current draft Belfast Metropolitan Area Plan. Northern Ireland Water is reported as follows "The site was built as a storm water pumping station in the 1930s by the then Belfast Corporation. Along with three other similar facilities elsewhere in the city, it has been out of service since late 2009, when the Belfast Storm Water Tunnel was commissioned." The 1951 street directory shows “10-14. Cairnes Ltd., Brewers, Drogheda (stores) Preston Bros., & Co., (Cairnes Ltd.), Wholesale Wine and Spirit Merchants. 16. Pumping Station 18. Entrance to Cattle Market 20-32. Wall”. 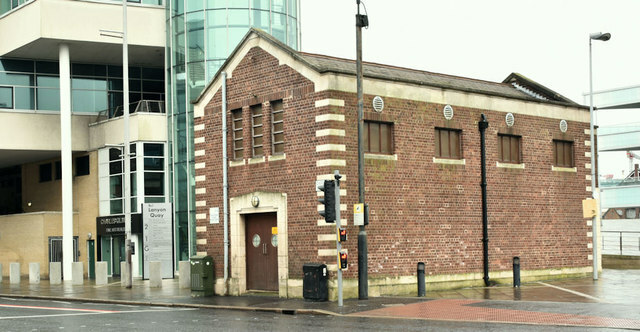 The station was the last remaining pre-Laganside building remaining on the street’s eastern side. It does not appear (at 13 December 2016) to be listed. There is the following application (6 March 2019) for planning permission “LA04/2019/0657/F Change of use from water pumping station to restaurant & café including external alterations & new 2 storey extension. 16 Oxford Street Belfast BT1 3WH”.